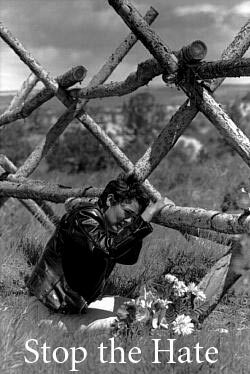 On October 6, 1998, Matthew Sheppard, a University of Wyoming student from Laramie, Wyoming, left a bar with two other men. Matthew was gay, and the two men pretended to be gay so that Matthew would go with them. The two men then drove to a remote area, dragged Matthew from the car, and brutally tortured him with a barrage of kicks and punches. They then produced a handgun and pistol-whipped his face until he was almost unrecognizable. Matthew, who was now unconcious and bleeding profusely, was then tied to a wooden split-rail fence in a type of mock crucifixion. 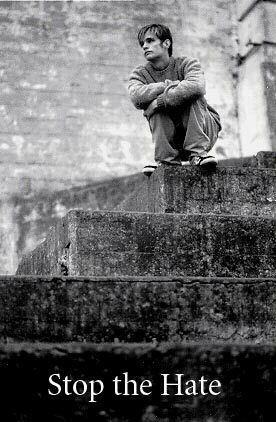 Hanging from the fence with severe injuries, and on the verge of death, Matthew was left to die. But Matthew was still clinging to life when the cowardly criminals left. The next day, some people found Matthew, and he was taken to the hospital in a coma. But Matthew died on October 12, 1998, without ever regaining consciousness. So what kind of a monster could torture a human being in such a heinous and evil manner? Answer: A monster who hates gays - or in this case, two monsters who hate gays: Aaron Mckinney and Russel Henderson. The torture and murder of this precious young man was all about one thing: hate. The cowardly, sick, evil murderers are now serving life terms in prison. And that same hate that was directed towards Matthew is directed towards gays throughout the world every day, and that hate can take many forms. But one very common form is verbal assaults - incessant name-calling that is designed to emotionally destroy a person. John French, a funeral director who lived in Chippenham, England, was a victim of this type of verbal bullying; he was assaulted with cruel, hateful words every day at work. Why? Because he was gay. John tried to reason with the workers who verbally attacked him, but that only caused the verbal attacks to escalate. So John approached his employer and filed a complaint about the incessant verbal abuse. John's boss launched what amounted to a superficial investigation, and then quickly proclaimed that the complaint was not valid. John was overwhelmed. Not only was he being subjected to the worst type of verbal abuse at work, but his homophobic boss was aware of the abuse and was not going to do anything about it. That night, John took an overdose of prescription medication in a suicide attempt. His partner of 12 years, Paul Tucker, was in the other room cooking dinner and was unaware of what John was doing. John started to feel sick and disoriented so he called his doctor and told him that he needed help because of an overdose of medication that he took. He also told him about the abuse that he was being subjected to and said that he wanted to jump off of a bridge. The doctor quickly called an ambulance. John was rushed to the hospital, but it was too late. John died by suicide in Feburary 2004 at the age of 36. 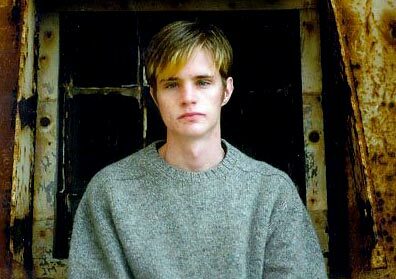 The horrible tragedies of Matthew Shepard and John French were rooted in hate. A hate that causes gays and lesbians pain every day. A hate that can cause depression. A hate that can lead to suicide. And a hate that can lead to murder. If you are gay or lesbian and think that you may be suffering from depression, please make appointments with a medical doctor and a therapist so you may be evaluated and treated. And please do not tolerate any kind of abuse - always report abuse to the proper authorities. And if you need to call the police, do not hesitate to do so. To all young gays and lesbians: Adopt a zero-tolerance attitude towards abuse. Speak up -- and stand up for your rights. And everyone who sees abuse against a gay or lesbian needs to stand up for that person. Defend him or her. Help him or her. File a compaint against the abuser. And, most of all, be part of the solution, not part of the problem. So let us all work together to -- Stop the hate. We will never forget you Matthew Sheppard -- you are now an angel. We will never forget you John French -- you are now an angel.